Picture: Christian G.E. Schiller and Patrick Johner, Weingut Johner, in Montreux at the 2014 DWCC, with a Weingut Johner Spätburgunder. Weingut Johner Wines came in at #17 and #18. Martin Zwick, the wine blogger from Berlin, is rapidly building up a reputation as being a mover and shaker in the German wine scene. This is due to the various Berlin Cups that he is organizing. It all started with the BerlinRieslingCup a few years ago, a blind tasting and ranking in November of what Martin Ziwck considered the leading Grosses Gewaechs wines - the ultra-premium dry wines of the VDP producers, Germany’s elite wine makers - that were released on September 1 of the same year. Initially, people did not pay much attention to the BerlinRieslingCup, but this has clearly changed over the years. But the BerlinCup is no longer just about Grosses Gewaechs wines, Martin has added a (1) BerlinGutsweinCup – ranking entry level wines, a (2) BerlinKabinettCup – ranking lightly sweet wines at the Kabinett level and a (3) BerlinSpaetburgunderCup – ranking German Pinot Noir wines. Pictures: Annette Schiller, ombiasy PR and WineTours, Friedrich Becker, Christian G.E. Schiller and Friedrich Wilhelm Becker at Weingut Friedrich Becker in Schweigen, Pfalz, during the 2014 Germany South Tour by ombiasy. Weingut Becker's St. Paul 2012 is #5. Picture: Senior Boss Werner Jülg, Weingut Jülg in Schweigen, Pfalz, and his 3 sons (during the 2014 Germany South Tour by ombiasy). Johannes Jülg (on the right) is in charge of Winemaking. His Pinot Noir came in as #7. Picture: Tasting with Christoph Thoerle, Weingut Toerle, during the 2013 German Wine and Culture Tour by ombiasy. 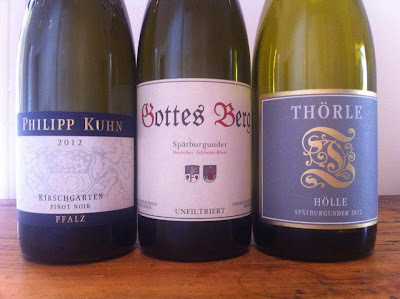 The Thörle Hölle Spätburgunder 2012 made it to #3. The BerlinSpaetburgunderCup 2012/2014 took place in early October 2014. Tasted and ranked were wines from mostly 2012. A group of sommeliers, wine retailers, wine bloggers, wine marketing people and Pinot Noir lovers tasted and ranked 32 wines. These were all ultra-premium wines, but not only VDP.Grosses Gewaechs wines. Pictures: Doerte Naekel and Christian Schiller at a Winemaker Dinner in 2013. The Meyer-Näkel Pfarrwingert 2012 is #4.